It was a great turnout for the December Club Meeting which took place at the usual Chino Community Center on December 8th, with 52 members in attendance to participate in the voting, Prizes and pizza socializing. December is usually a great month to attend, as the club springs for pizza and sodas, you get a chance to vote for the board, and there is lots cash prizes. Also, because there are so many members in attendence, its nice to swap stories and catch up with members you may not have seen for a while. Larry Marsh read the minutes for the minutes for November and Bill sheets read the treasury report. Chuck led the meeting by thanking the members and the board for making the year a good one. He also thanked Bill Sheets for his efforts this year. He reported There are already 191 members for 2016 and climbing which is a good sign. Cal Oar talked about toys for tots. 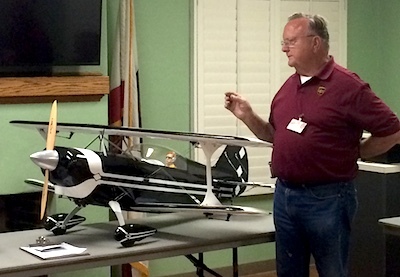 We had 42 pilots and 19 swap meet participants. It was the largest event we had all year, and had the most participants. It was nice to see folks showing up. Its always disappointing to know that you have over 400 members, yet only 20-25 members actually show up to participate, so it was nice to see the large turn out. 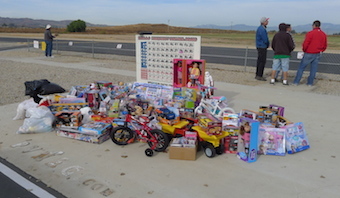 The PVMAC took in $535 from the pilots and swap meet folks who didn’t bring in toys. Chuck mentioned that he was the first one to hit the fence at Toys for Tots but not the last, In total there were 2 more minor incidents. The Dog Club who uses some space at our field occasionally also donated a lot of toys, which was appreciated by the members as well as the families that will receive the toys. The snack bar brought $314. The cost of the food was donated by te PVMAC, thus 100% of the snack bar proceeds go towards the Toys For Tots. In total we raised $1625 in proceeds and donations for Toys for tots. Steve Parolla’s wife will use that money to buy toys for the kids, as the organization does not accept cash. Overall it was a terrific day without any wind, and though it was a bit cold starting out, it warmed up to be a great California day for flying. They need help for the AMA show, if you would like to volunteer, please contact any of the board members via the contact page. If you donate at least a 4 hour block of time, you will be able to get in for free. The Security will be heightened for this years event so be prepared for that. It should be a great event as usual, so you will definitely not want to miss it. The next Pattern contest at the PVMAC has been slated October 1st and 2nd. However, the January Pattern event ,which was tentatively planned is not happening, as most of the people who would help put on the event will be tired from helping at the AMA event, and attendace has been exceptionally low. The PVMAC and the board would like to thank Roy Barringer for his distinguished service to the Club for 8 years. Roy is stepped down as a board member this year, but will continue to be an active in the hobby. Roy has been instrumental in organizing the presence at the AMA Show for the last few years. As you know we nominate candidates for the board at the October meeting, and elect 9 members to the board in December. With Roy stepping down that left only one open position. With a required quorum in attendance, the voting was concluded at 7:23pm and a New Board member was elected. Please welcome Mike Keys to the Board. Chuck Pozonac announced that The Big Jolt has been cancelled due to lack of participation in 2015. The PVMAC instead will be holding only one event next year which will be a Scale event for both electrics and gas. It Will be in June and the board are still working on nailing down the date. Tom Marcure thanked everyone who turned in their articles, and awarded $100 to each of the people who contributed an article for the newsletter; $600 in total. It was a close call, but Donald Fulton a new member stepped up to become the newsletter editor, So the newsletter will continue. However, it was agreed that producing a newsletter on a monthly basis is extremely time consuming, so the newsletter will now be on a quarterly basis. Loni Morrison brought in a beautiful new Great Planes Christian Eagle 28% ARF which had not been flown yet. He didn’t like the original scheme, which has been done to death, so he stripped it and and refinished in a striking black and white Monocote. It has 12 channels with Smoke. He also mentioned that the Flat wire lines that add a touch of scale to it was added, and is available exclusively at Hobbyclub USA, which also has all the turnbuckles needed to complete the look. Greg Stockdale brought in a brand new Horizon e-flight Ultimate 2. In fact it was so new that the UPS guy had just dropped in on his doorstep just hours earlier, so he brought it in, box and all. It has a 1300kv motor, Takes a 3 cell 2200 battery, Has AS3X installed with SAFE features with 3 modes of flying , including recovery mode like the safe planes. Greg has been saying that he is getting out of electrics and moving into Gas, but this model was just too nice to pass up. The first step in recovery is always admitting you have a problem. Oscar Furlong brought in his new mini Helicopter from horizon, the Blade CPx. It has a different setting on board so that you can control the amount of control you have over the heli, which can keep the flight stable if your new to flying helicopters. Oscar reports this is For beginners and for indoors mostly but outdoors in no wind conditions. The 50/50 drawing was for $104 and $103, which, none went to the club. Joni Whitsitt and Oscar Furlong won the prize. Loni Morrison won first place $300 for the Show and tell prize, George Pollard won 2nd prize of $250 -Loni also won the $75 Prize for showing up to the meeting, it was his lucky night.